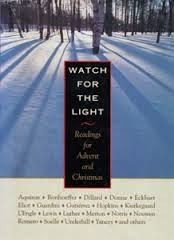 I really love a good advent book. I love reflecting on my spiritual life at Christmas and I think the reason is because there is such a gentle hope in Christmas in the middle of all the hurt and heartache. Watch for the Light is pretty perfect for the thoughtful person. Filled with reflections by some of the greatest names in Christian thought, the entries and piercing, gentle, probing, and comforting. It's a really fantastic reminder of what Advent is all about. The book itself is a beautiful hardcover but small enough to easily transport during the busiest time of year. I haven't had a chance to fully finish the book as I received it later than expected but I can give its recommendation with full confidence.